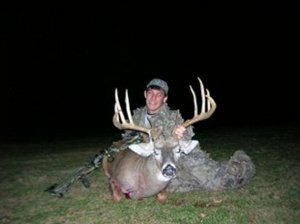 This outfitter has the premium Kansas farm ground, woodlots and river bottoms for big whitetails and turkey. You will be hunting primarily in Unit 8 so put that as your primary, weather you are hunting Archery, Muzzleloader or Rifle for Whitetail Deer. These hunts come with 6 days 7 nights lodging in Washington and Clay Counties. Lunch and supper are not included but can be added for the duration of the hunt for only $100. We are hunting mature bucks only with no inch restrictions from blinds and stands that are heavily baited. The outfitter has a 6 square mile hunting area with prime mature Kansas whitetail bucks. There is a 65% chance of having the opportunity to shoot at a mature buck with our average buck scoring between 140-160 B&C Gross score. Your guide has pre-scouted the area and will take you to your hunting area and be certain that you can get in your tree stand. The hunter is responsible for bringing his choice of tree stand safety harnesses and they are to be used at all times when elevated above the ground level. All of the baits and attractants used are legal in Kansas. The Spring Turkey hunts are 4 days 5 nights with lodging, with no meals, but lunch and supper can be added for $ 100 for the whole hunt. The Blinds are baited for bowhunting and filming the hunts. We have over 15 square miles of private land for Turkey hunting. Our success is exceptional with last year 16 clients took 31 longbeards, one hunter only having one turkey license. We are always certain that this quality turkey hunting will continue because we use real mounted turkeys and our guides are expert turkey callers with years of experience. You will be taken to an area that the guide has pre-scouted and patterned the birds. We handle your dead bird as far as cleaning it and can even prepare it for the taxidermist. Special guiding is an additional charge of $ 150 per day. Fall Turkey Hunts are very limited because we like to keep the woods as quiet as possible for the deer hunting and we don’t like to have hens shot. 10/01-11/29 and it opens again after the rifle deer season is over for 12/31-01/31. Application Deadline: The application deadline for the lottery is May 1st thru May 31st. When you book the outfitters will notify you at the time of application, the applicant is responsible for applying. They will provide any assistance necessary in filling them out.